When Lady Katherine's father is killed for being an illegally practicing Catholic, she discovers treason wasn't the only secret he's been hiding: he was also involved in a murder plot against the reigning Queen Elizabeth I. With nothing left to lose, Katherine disguises herself as a boy and travels to London to fulfill her father's mission, and to take it one step further--kill the queen herself. Katherine's opportunity comes in the form of William Shakespeare's newest play, which is to be performed in front of Her Majesty. But what she doesn't know is that the play is not just a play--it's a plot to root out insurrectionists and destroy the rebellion once and for all. The mastermind behind this ruse is Toby Ellis, a young spy for the queen with secrets of his own. When Toby and Katherine are cast opposite each other as the play's leads, they find themselves inexplicably drawn to one another. But the closer they grow, the more precarious their positions become. And soon they learn that star-crossed love, mistaken identity, and betrayal are far more dangerous off the stage than on. 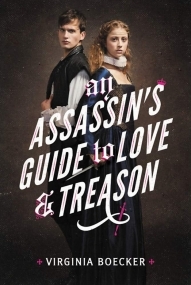 AN ASSASSIN’S GUIDE TO LOVE & TREASON by Virginia Boecker is such a breath of fresh air. It’s a YA historical fiction novel that promises espionage, mistaken identity, and betrayal, all unfolding in Shakespeare’s Globe Theater. The story starts when Katherine’s father is killed for his religious beliefs, forcing Katherine to flee to London and disguise herself as a boy. With her heart bent on revenge, she plans to rid England of the queen once and for all. Toby, a reluctant spy for the queen, is hired to draw out the Catholics who wish her dead, which he does by creating a Twelfth Night play. Soon, both Katherine, now known as Kit, and Toby are acting together. By fate, they end up in their own private rehearsals and begin to fall in love, completely unaware that the other is their enemy. As if I wasn’t sold enough already, I couldn’t pass over this cover. It is gorgeous. On it, the two characters are portrayed in such a way that I want to know more about them. They both look determined and full of agency, which is what I like in a story. The dark brown backdrop makes it feel like it’s from an older time, but the hot pink detailing is a contemporary touch and lets me know I’m in for some fun. The varying page widths are also a creative way to harken back to literature from earlier centuries. In other words, the packaging of this book really makes it fly off the shelf for me. The first half of the novel moves at a slower pace than I would expect. It takes time to build the character’s backstory and to layer in their present circumstances, which I needed to digest in smaller pieces. I also had a hard time believing the foundation for the murder plot from both Katherine and Toby’s sides. However, I let it go for entertainment purposes and the story began to pick up steam, especially as the characters began to evolve. Boecker paints an extremely vivid picture of London during Queen Elizabeth I’s reign. It’s scary, exciting, and has kept me captivated for days after finishing the book. Overall, AN ASSASSIN’S GUIDE TO LOVE & TREASON will appeal to fans of SHAKESPEARE IN LOVE (1998), the movie directed by John Madden, and practically anyone else who has a pulse.